There are a few bready-junk foods I really miss eating while following a WFPB lifestyle: plain cheese pizza, cinnamon-sugar cake donuts, and soft pretzels. I’m not sure why I have such specific hankerings for these foods because I barely ate any of them before moving to wfpb-eating. 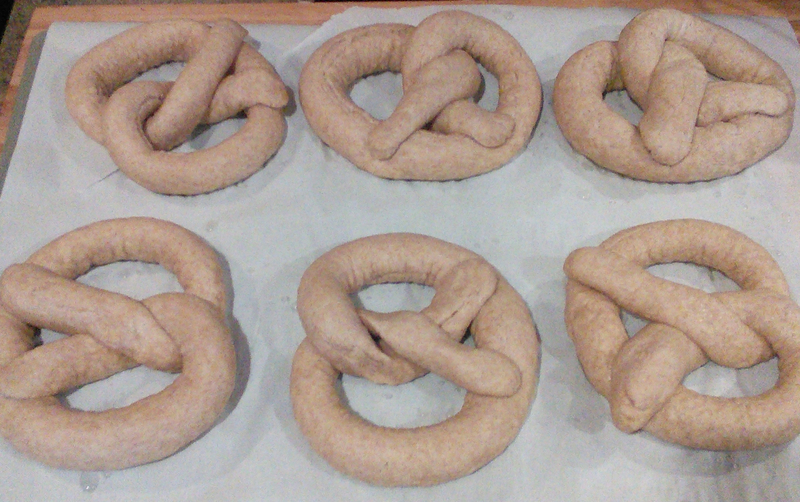 I wanted to try to satisfy at least one of these cravings, so I attempted the only wfpb soft pretzel recipe I’ve seen so far: “Philly-Style Soft Pretzels” from The Prevent and Reverse Heart Disease Cookbook. 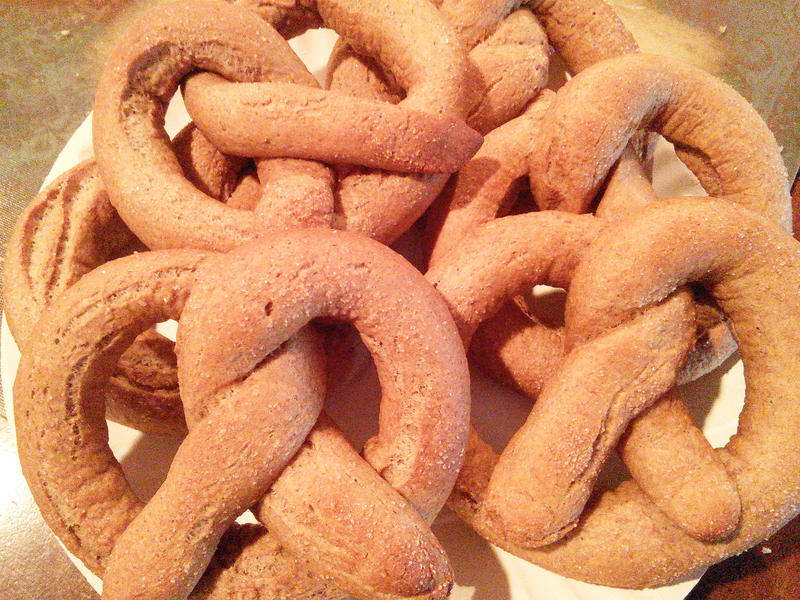 The pretzels require a bit of time and effort, but they are worth it. I do recommend considering doubling the recipe. For the effort you need to put in to make them, 6 pretzels might feel like kind of a letdown. In a large bowl (try to use one with a wide-ish bottom, especially if you’re doubling the recipe), mix together the warm water, yeast, maple syrup, and flours. Stir until the dough forms a large clump with an elastic feel. This will be very thick. I gave up using a spatula and resorted to mixing it with my hand. The original recipe direction says “Divide the dough into 6 equal clumps—each about the size of a small egg—and form them into balls.” Either I have no idea what the size of a small egg is, or the dough makes way more than 6 “small” eggs. I had something more akin to “jumbo+” eggs. If you are doubling the recipe, make 12 dough balls. Otherwise you’ll have 6 huge pretzels, which would be awesome if that’s what you’re going for. Cover the bowl (containing the jumbo+ doughballs) with a damp kitchen towel and let the doughballs rise for at least 25 minutes. I set my timer for 25 minutes exactly because I was impatient to eat soft pretzels. While waiting on the doughballs to rise, preheat your oven to 400° and line a baking sheet with parchment paper. 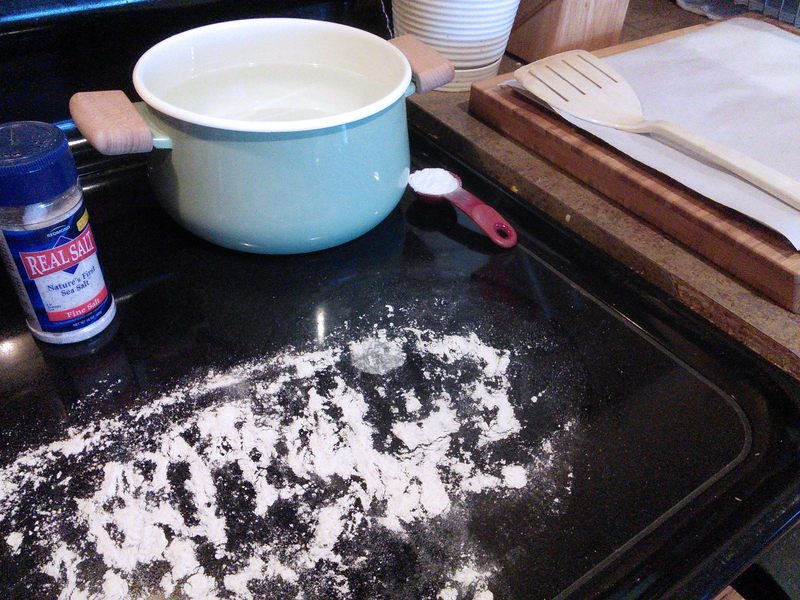 Prepare a large pot with water, bring it to a boil, and add the 2 tbs of baking soda. Lightly flour the surface area where you will roll out the dough balls into ropes. Pick your largest slotted spoon or spatula—you will need this to boil the pretzels. Prepare whatever topping you are choosing to add (or leave ’em plain!). I am using regular sea salt as my pretzel topping. When the doughballs are done rising, they should look pretty poofed up. 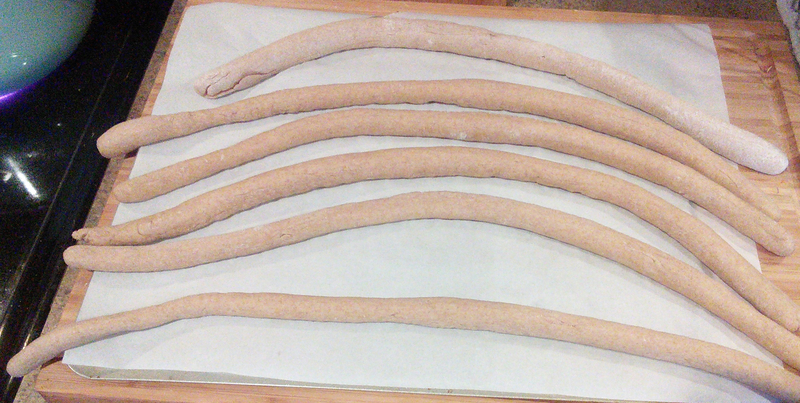 Roll the doughballs into 12 to 18 inch-long ropes. You may or may not need to actually use a floured surface. I used the floured surface for my first rope (the one on top in the picture below) but found it was completely unnecessary. 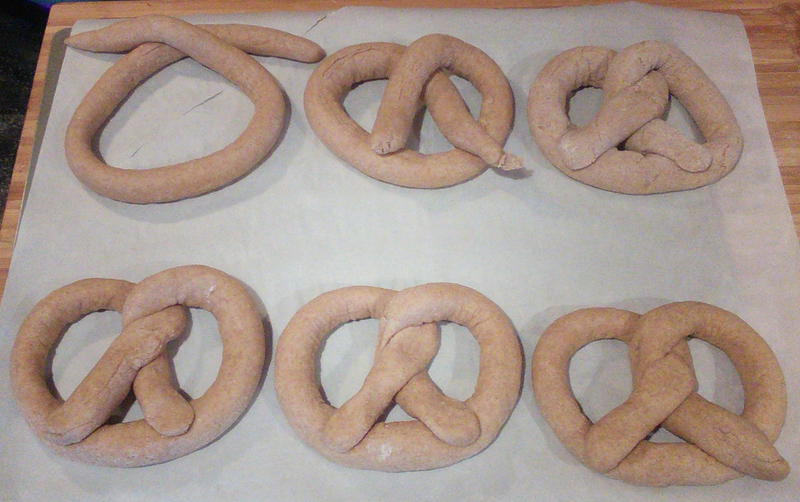 Form the pretzel shape, or really whatever shape you want so long as you can get it in and out of the large pot. 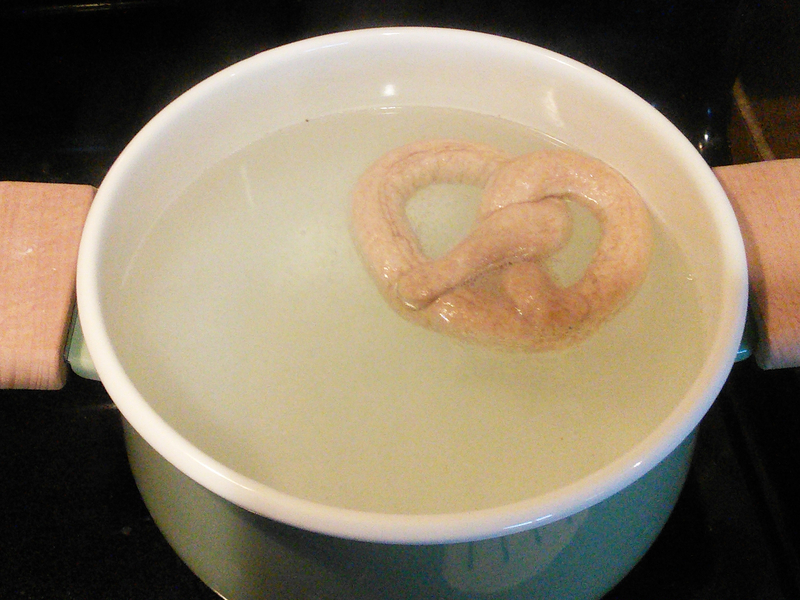 Set the raw pretzel on your slotted spoon or spatula and place it into the boiling water/baking soda for 10 seconds. Remove the pretzel from the water and place it onto the lined baking sheet. Do this for each pretzel. While the pretzels are still damp, sprinkle or coat with toppings of choice, or nothing at all. When all the pretzels are done boiling, bake them for 12 to 15 minutes. I baked mine for 13 minutes. These are best when served warm! They are still good reheated or at room temperature, but, like most baked goods, they are best when eaten right out of the oven.